Syria is likely to remain a broken country for years to come. The latest strikes did not change that reality. Panelists discuss the ongoing conflict in Northern Syria and how the United States should handle its relationships with the affected parties, including Turkey and the Kurds. 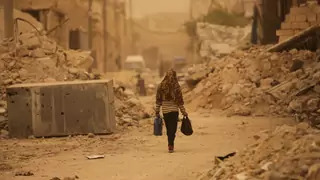 After the liberation of Raqqa, Syria, women are returning to the city with their families and taking on new roles in the rebuilding process. Panelists analyze Iran's foreign policy strategy, including their regional ambitions and interventions in Syria and Yemen, and offer recommendations on ways the United States should proceed after withdrawing from the JCPOA. Mona Yacoubian, senior advisor for Syria, Middle East, and North Africa at the United States Institute for Peace, joins James M. Lindsay to discuss the Trump administration's plans to withdraw troops from Syria. The UN Security Council debates the humanitarian crisis in Syria, U.S.-China trade talks continue in Washington, and the United States and South Korea work to renew a military cost-sharing deal. Test your knowledge of the Kurds, from their campaign for statehood to their role in the Syria conflict. Discussion of "82 Names: Syria, Please Don't Forget Us"
CFR hosts a screening of 82 Names: Syria, Please Don't Forget Us, a documentary film co-produced with the United Sates Holocaust Memorial Museum and Maziar Bahari, that traces the journey of Mansour Omari, a survivor of torture and imprisonment in Syria.